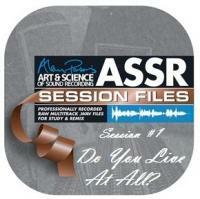 ASSR - Session 1 - Do You Live At All? Session 1 - Do You Live At All? Session 1 Title: Do You Live At All? Instrumentation: Drums, percussion, bass, guitars (electric, EBow, acoustic, mandolin), acoustic grand piano, Hammond B3, male lead vocal, harmony vocals, male choir, female choir. A classic rock/pop big production. This track was recorded at The Village in Los Angeles, where innumerable hit records have been made including Steely Dan’s Aja and Fleetwood Mac’s Tusk. The instrumentation is interesting and varied, especially with guitar where a variety of electric guitar parts were recorded including EBow (a hand-held electronic bowing device). The main guitar part is an acoustic guitar, which, using his own time-honored methodology, Alan triple-tracked, using de-tuning. There’s also a mandolin track. Also making this session a little unusual are extensive vocals – lead vocal and harmonies plus two sets of choirs: male and female. This is a large session, with 61 tracks and tons of vocals. We'd advise not making this song your first venture into large scale mixing/remixing.